To Cite: Bahmani A, Jabbarpour Bonyadi M, Tagavi S. The Association of the TNF-α-308G/A Gene with Recurrent Miscarriage Abortions in East Azarbaijan, J Kermanshah Univ Med Sci. 2018 ; 22(3):e84383. doi: 10.5812/jkums.84383. Background: Recurrent pregnancy loss (RPL) is defined as two or more pregnancy losses before 20 weeks gestation. -TNF-α is a pro-inflammatory cytokine that has been proposed a candidate gene for the pathogenesis of RPL. This study aimed to investigate the association of TNF-α-308G/A polymorphism with RPL among East Azarbaijan population. Methods: The patient group comprised 100 women with the experience of three pregnancy losses and the control group comprised 100 women without any previous history of pregnancy loss. Genotype TNF-α-308G/A was detected using PCR-RFLP assay. Results: The observed frequencies of GG and GA genotypes of TNF-α-308G/A polymorphism were respectively 84% and 16% in the patient group and 81% and 19% in the control group. AA genotype was not observed in any of the groups. Conclusions: Our results suggest that the TNF-α-308G/A polymorphism is not associated with RPL in East Azarbaijan women. Generally, recurrent pregnancy loss (RPL) is defined as two or more consecutive or separated pregnancy losses before 20 weeks gestation (1). Approximately 50 percent of all RPLs occur unexplained. Among the possible causes of unexplained miscarriages are gene polymorphisms (2). In normal pregnancies, the ratio of TH2 to TH1 cells in the endometrium and decidua is high. An increase in the ratio of TH1 cells that produce TNF, IL-2, and INFY cytokines, which are harmful for the fetus, to TH2 cells that produce IL-4, IL-5, IL-15, and LIF cytokines, which are useful for the fetus, increase the toxicity effect on the fetus or ultimately lead to implantation failure and miscarriage (3, 4). TNF-α gene is located on the short arm of chromosome 6 (6p21.3). It is about 3.6 Kb long and consists of 4 exons. Its last exon encodes more than 80% of the secretory protein (5). There are many polymorphisms inside or around the TNF-α gene, most of which are located upstream of the gene and are associated with the transcription start site. Most TNF-α promoter region polymorphisms have shown that the -308G, -1031C, -863A, and -857T alleles directly increase the gene expression. According to previous studies, TH1 cytokines cause coagulation and inflammatory processes in the placenta and uterus that lead to miscarriage. There are two major polymorphisms in the promoter region of this gene in -228 and -308 nucleotides, which play a major role in its expression. They are chosen because many studies have been conducted on these polymorphisms and their association with various diseases (6). When the fetus is identified as a foreign body, mother’s immune system responds against it. During pregnancy, all lymphocytes are in contact with trophoblasts and create cellular immune responses. Studies have shown that increased Th1 lymphocytes increase toxin levels against the fetus and ultimately lead to implantation failure and miscarriage. In the presence of sufficient amounts of progesterone, the PIBF secreted from CD56 cells of the decidua and active interstitial lymphocytes stimulates the production of protective TH2 cytokines and reduces the production of TH1 cytotoxic cytokines. Progesterone produces its anti-abortion effects by inducing PIBF production (7). Therefore, due to the fact that this gene was not investigated in the northwest of Iran, the present study investigated the association of a polymorphism of this gene with RPL in women of Eastern Azarbaijan in Iran. The present study recruited 100 patients with a history of three spontaneous RPLs before 20 weeks of gestation and 100 individuals with no history of miscarriage and with at least two children as controls. Demographic information (e.g. age, number of children, medical records) was recorded. The participants’ age ranged from 21 to 46 with a mean of 31.20 years in the control group, and from 19 to 44 with a mean of 30.95 years in the patient group. The inclusion criteria were the number of miscarriages in the patient group and the number of children in the control group, who were selected under the supervision of a gynecologist from among women in the East Azarbaijan. The participants signed a written consent for blood sampling. Blood samples of 4 mL were taken and stored in EDTA solution at a temperature below 20°C until extraction. DNA was extracted from peripheral blood leukocyte by the saturated salt method (8). RFLP-PCR technique was used to determine the genotype of TNFα-308G/A polymorphism. To investigate the -308G/A polymorphism, part of the TNF-α promoter with a length of 107 bp was proliferated using F proliferative primers of AGGCAATAGGTTTTGAGGGCCAT and R: TCCTCCCTGCTCCGATTCCG from a study by Kamoun. The PCR program was run in 34 cycles as follows: 30 seconds of initial denaturation at 95°C, 10 seconds of primer binding at 67°C, 30 seconds of extension at 72°C, and 5 minutes of final extension at 72°C. PCR products were electrophoresed on a 2% agarose gel stained with safe stain. In order to detect polymorphism, the TNFα-308G/A gene was digested with the NCO1 enzyme (Fermentas Co.) at 37°C for 24 hours. The PCR product used to examine this polymorphism was 107 bp, which represents the AA genotype. 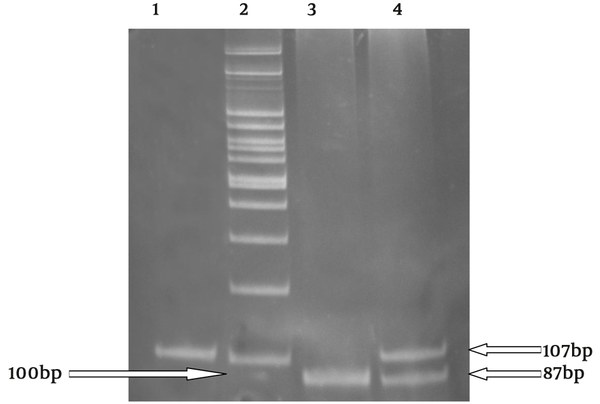 In the presence of individuals with the heterozygote genotype GA, 87 and 20 bp fragments were made, where the 20 bp band was not shown in the gel (Figure 1). PCR products were transferred onto 8% polyacrylamide gel after enzyme digestion. After staining with ethidium bromide, the results were analyzed by 2 × 2. Contingency software using the Chi-square test. The P-value less than 0.05 was considered significant in this study. One hundred patients and 100 healthy participants were examined for TNF-α-308G/A polymorphism. The frequency of GG and GA genotypes of TNF-α-308G/A polymorphism was 84 (84%) and 16 (16%) in the patient group and 81 (81%) and 19 (19%) in the control group, respectively. The AA genotype was not observed in any of the groups. The allele frequency of TNFα-308 polymorphism was 92% and 90.5% for allele G and 8% and 9.5% for allele A in the patient and control groups, respectively. Statistical analysis of genotypic and allelic frequencies showed no significant relationship between the patient and control groups. The results of the statistical analysis are presented in Table 1. The aim of this study was to investigate TNFα-308G/A gene polymorphism in relation to the increased risk of RPL in patients of East Azarbaijan in Iran. Statistical analysis between the allelic frequency of the two groups of patients and controls showed no significant difference (P = 0.3). A study in 2013 showed a significant association between TNFα-308G/A polymorphism and RPL in Saudi Arabia (9). No significant relationship was observed in China, though (10). The findings in the present study were different from those of other RPL studies. The reason for the difference in the results of gene polymorphism studies can be due to genetic and geographical differences and a small sample size, which requires studies with larger sample sizes. The present study found no relationship between TNFα-308G/A gene polymorphism and RPL in the female population of East Azarbaijan in Iran. All the families of the patients who participated in the project are sincerely thanked. 1. Practice Committee of the American Society for Reproductive M. Evaluation and treatment of recurrent pregnancy loss: A committee opinion. Fertil Steril. 2012;98(5):1103-11. doi: 10.1016/j.fertnstert.2012.06.048. [PubMed: 22835448]. 2. Jauniaux E, Farquharson RG, Christiansen OB, Exalto N. Evidence-based guidelines for the investigation and medical treatment of recurrent miscarriage. Hum Reprod. 2006;21(9):2216-22. doi: 10.1093/humrep/del150. [PubMed: 16707507]. 3. Mojarrad M, Hassanzadeh-Nazarabadi M, Tafazoli N. Polymorphism of genes and implantation failure. Int J Mol Cell Med. 2013;2(1):1-8. [PubMed: 24551783]. [PubMed Central: PMC3920519]. 4. Mohlin FC, Mercier E, Fremeaux-Bacchi V, Liszewski MK, Atkinson JP, Gris JC, et al. Analysis of genes coding for CD46, CD55, and C4b-binding protein in patients with idiopathic, recurrent, spontaneous pregnancy loss. Eur J Immunol. 2013;43(6):1617-29. doi: 10.1002/eji.201243196. [PubMed: 23508668]. [PubMed Central: PMC3760018]. 5. Hajeer AH, Hutchinson IV. TNF-alpha gene polymorphism: Clinical and biological implications. Microsc Res Tech. 2000;50(3):216-28. doi: 10.1002/1097-0029(20000801)50:3<216::AID-JEMT5>3.0.CO;2-Q. [PubMed: 10891887]. 6. Stephenson MD. Frequency of factors associated with habitual abortion in 197 couples. Fertil Steril. 1996;66(1):24-9. [PubMed: 8752606]. 7. Bombell S, McGuire W. Cytokine polymorphisms in women with recurrent pregnancy loss: Meta-analysis. Aust N Z J Obstet Gynaecol. 2008;48(2):147-54. doi: 10.1111/j.1479-828X.2008.00843.x. [PubMed: 18366487]. 8. Peters JL, Sutton AJ, Jones DR, Abrams KR, Rushton L. Contour-enhanced meta-analysis funnel plots help distinguish publication bias from other causes of asymmetry. J Clin Epidemiol. 2008;61(10):991-6. doi: 10.1016/j.jclinepi.2007.11.010. [PubMed: 18538991]. 9. Alkhuriji AF, Alhimaidi AR, Babay ZA, Wary AS. The relationship between cytokine gene polymorphism and unexplained recurrent spontaneous abortion in Saudi females. Saudi Med J. 2013;34(5):484-9. [PubMed: 23677264]. 10. Liu C, Wang J, Zhou S, Wang B, Ma X. Association between -238 but not -308 polymorphism of Tumor necrosis factor alpha (TNF-alpha)v and unexplained recurrent spontaneous abortion (URSA) in Chinese population. Reprod Biol Endocrinol. 2010;8:114. doi: 10.1186/1477-7827-8-114. [PubMed: 20920206]. [PubMed Central: PMC2956720].